Making a pretty garden come to life in a window is possible when you have the right stamp set and framelits, and inspiration from Lisa Wilkinson. Lol! I stamped out flowers and leaves from the Flower Patch stamp set using various inks (Blushing Bride, Melon Mambo, Wisteria Wonder, Elegant Eggplant, Certainly Celery and Wild Wasabi) and cut it out with Flower Fair framelits. 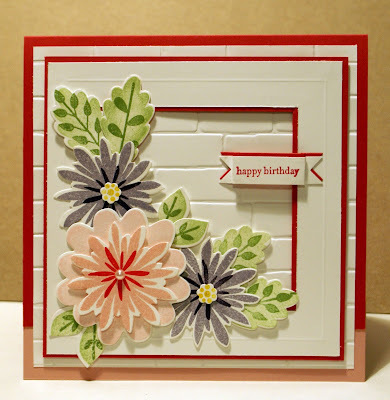 I made my card base square with Melon Mambo and Blushing Bride cardstock, and ran some Whisper White through my Big Shot with the Brick Wall embossing folder to make the wall as my first card layer. Then I cut and matted a window frame with my Paper Trimmer and some Melon Mambo cardstock. I ran a scored line inside my frame so it looked more like a casement. 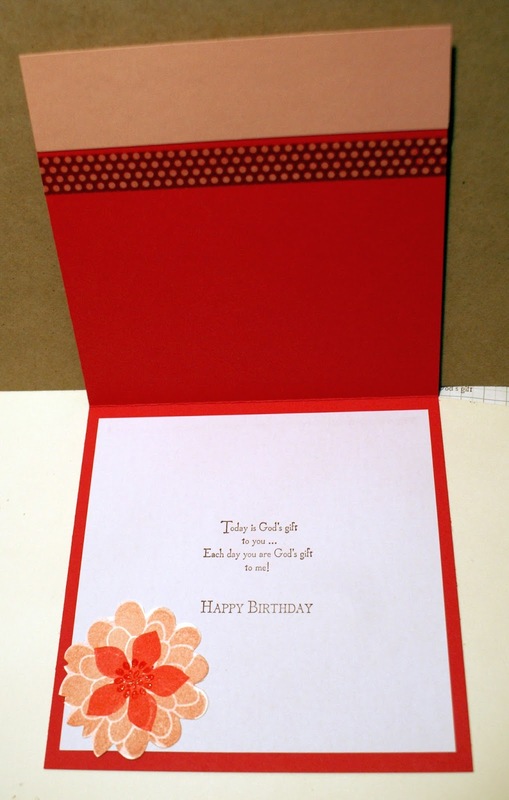 Finally I added all the flowers and leaves, popping them up with Stampin' Dimensionals. I made the sentiment banner, folding the ends back on themselves, and added my greeting from Teeny Tiny Sentiments before popping it up too. I wanted to make the inside of the card special too so added some retired Washi Tape, another flower and a sentiment form God's Blessings.